"My 1st real job as a teen is working in the local Ford Dealership as a 2nd shift janitor. After doing the garbage and swabbing the deck, I would then get to wash a few cars. 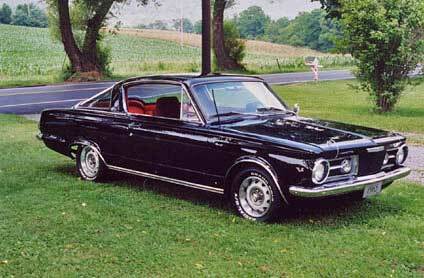 At this time I am 16 and driving a 1963 corvair. I had loved cars even as early as 9 when I can remember putting together models after models after models. I not only got to wash the cars but got to drive them back onto the lot and bring another one in. I remember washing and driving a 66 GTO and falling in love with the power. Soon after this my Dad buys a new Roadrunner in 1968 and I am officially hooked. I have never gone so fast on 4 wheels. This was the 1st 4 bbl I have ever driven and WOW!!! The corvair bites the dust and I get a 64 VW bug which my dad chops into a dune buggy. Still a far cry from the GTO and Roadrunner power. 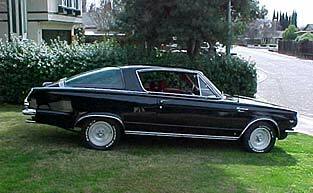 Finally, I see a 65 Barracuda in 1972 on a Buick car lot about 10 miles away. The VW bug is now history and for $600.00 I am the owner of a 65 Fish, Hurst 4 speed, 273 2bbl. I am now officially in car heaven. I wash that car every week. It uses more oil than gas, a real crop duster. My great Uncle gives me his used oil to put in my car since I go thru about 1 qt./week. Graduation form High school happens and I go back to work at the Ford garage for the summer this time as a full time car washer and detailer. To this day I really use many of the car cleaning techniques I learned as a teen. Fall rolls around and off to College 2 hours away. Freshman cannot have cars on campus so while away, Mom sells the car for $300.00. (I am still crushed). 26 years go by. I now have a wife and 10 year old son. I am self employed and doing exactly what I love to do. Something is missing. I am still not over mom selling the '65 while I am away at college. I have an itch that needs scratched and big time. My home town has a huge car show every summer and I never miss them. All those beautiful cars!!! I must have one too!! I begin an intense search for another '65 using the Internet. 4 months later I am the owner of a 65 Barracuda again. I found it in Sacramento (I live in Pennsylvania). I corresponded back and forth with the owner for 2 months and finally agreed to go for it. I contacted a shipper and 2 weeks later it was delivered in an enclosed carrier. The car is black with red interior, Hurst 4 speed, 273 4bbl, front and rear sway bars, air shocks and electronic ignition. The itch is now scratched and the void is now closed. This car is in 10 times better shape than the one I had in High School. Good things come to those who wait!!!" 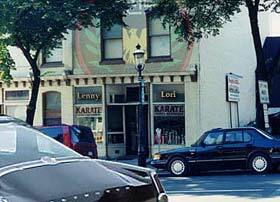 Lenny Young runs a Tae Kwon Do business in Bellefonte PA with his wife Lori and son Seth. Details available at www.youngtkd.com. To the right is a picture courtesy of Don Curle, of what the school might look like if modesty were of no concern.